Laser dentistry is a cutting edge and practical way to improve the health and appearance of your teeth. The technology involves using extremely focused light beams, or lasers, to perform procedures within the mouth. There are a variety of benefits associated with laser dentistry, such as fewer infections, reduced need for anesthesia, minimal damage to gums, and less blood loss during procedures. Patients that are fearful of drills and invasive dental procedures are typically very fond of laser dentistry techniques. Laser dentistry first became prominent in 1994 and has continuously revolutionized the way dentists help their patients. Periodontics & Implant Dentistry Center, LLC offers a variety of services in laser dentistry in Stamford, CT. We have been using laser technology with great success for many years. There is no better feeling for a dentist than helping a patient achieve the smile of their dreams. 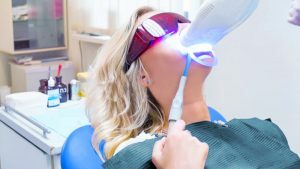 The following article provides details on the primary uses for laser dentistry to give you a better idea of why this technology is so compelling. Tooth decay can be a tricky condition for dentists to treat. With laser dentistry, dental professionals are able to remove decay within a tooth using the highly concentrated light beams. They are also able to prepare the enamel surrounding the tooth for the receipt of fillings. The great part about using lasers to treat tooth decay is that lasers might eliminate the need for anesthetic injections. Another way that dentists use laser dentistry to treat patients is to reshape gums and get rid of harmful bacteria during root canal procedures. Gum disease is a chronic inflammatory disease that affects gum tissue and the bones that support the teeth. The laser kills bacteria and also promotes the growth of stem cell tissue. This helps the gums heal more quickly and regenerate connective tissue and bone. If you are seeking a gum disease dentist in Fairfield County, CT, Periodontics & Implant Dentistry Center, LLC can certainly help! Taking care of your teeth and maintaining a healthy smile is a great way to keep your confidence high. Having a brilliant smile is priceless. Another compelling use for laser dentistry is for teeth whitening procedures. Dentists will typically use a peroxide bleaching solution that is applied to the tooth surface. After the solution is applied, a laser is pointed at the teeth to activate the solution. Laser dentistry in Stamford, CT is a pleasure, thanks to the professionals at Periodontics & Implant Dentistry Center, LLC.